A couple of years ago, I reviewed Philippa Leathers' The Black Rabbit. At the time, it was her only book, and I was so hopeful that it wouldn't be too long before she came out with another one. Well, I'm thrilled to tell you that day has arrived (or almost--release date: April 28th). This one stars a little orange cat named Clemmie (cute name, don't you think?). Clemmie is an excellent mouse catcher . . . she thinks. 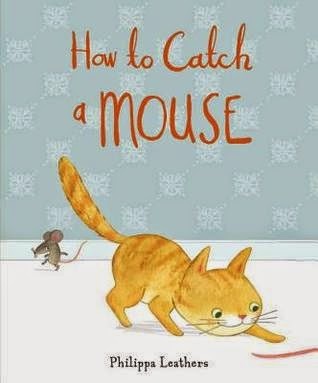 To date, she's never actually caught a mouse, nor, erm, ever actually seen one either. But she knows exactly what to look for: a whiskery, pointy nose, two round ears, and a long pink tail. And she's seen nothing that meets that description. It must be because all mice are afraid of her. What she doesn't know is that the mouse (because, in fact, there is one) has been taking lessons right along with her and has found a way to disguise his incriminating body parts. But the disguise gives him a false sense of security, and Clemmie soon learns that two can play at this game . . .
As with The Black Rabbit, the reader is immediately armed with some important information that the main character doesn't know. (In The Black Rabbit, it was that the "rabbit" he was so afraid of was actually his shadow; in this one, it is that the mouse happens to be much closer than Clemmie thinks.) My kids loved finding and pointing to the mouse each time. They tried to get Clemmie to see her error, but she was too busy chasing down things that met the mouse description but that weren't actually mice. The illustrations are charming. My favorite one shows Clemmie studying a book about mice. Unbeknownst to her, the mouse is standing right behind her, taking careful note of everything as well. Each picture is a careful balance between the sneaky and the obvious. It's one of those books that makes a great readaloud (which you would think all picture books should be, but trust me, they're not). And although it was great fun to read it to just my kids, it would also be an excellent choice for a large group story time. I have to admit that I'm getting a little sick of picture books that end with two enemies becoming friends (the wolf and the lamb, the fox and the rabbit, the shark and the fish, etc.). Don't get me wrong, that's a great premise, but sometimes it's entirely unbelievable. So I love it that this book ends with no such resolution. It leaves you with a bit of a cliffhanger: the chase is still on, their relationship is still fraught with distrust, and you know there are still many exciting times ahead. Philippa Leathers has created another winner, which leads me to say what I said in my review two years ago: "I'm so hopeful that she'll write and illustrate many, many more." Many thanks to Candlewick Press for a hardback copy of this book to review. All opinions are my own. Sounds great! We'll have to check it out when it's released. The ubiquity of "and then they were all friends" is one of the reasons the hat books are so refreshing (This Is Not My Hat & Have You Seen My Hat?). It's fun to read these kinds of books and pretend to be as clueless as the protagonist, if your kids are into that kind of thing. Those are great examples of some other books that don't end happily ever after.